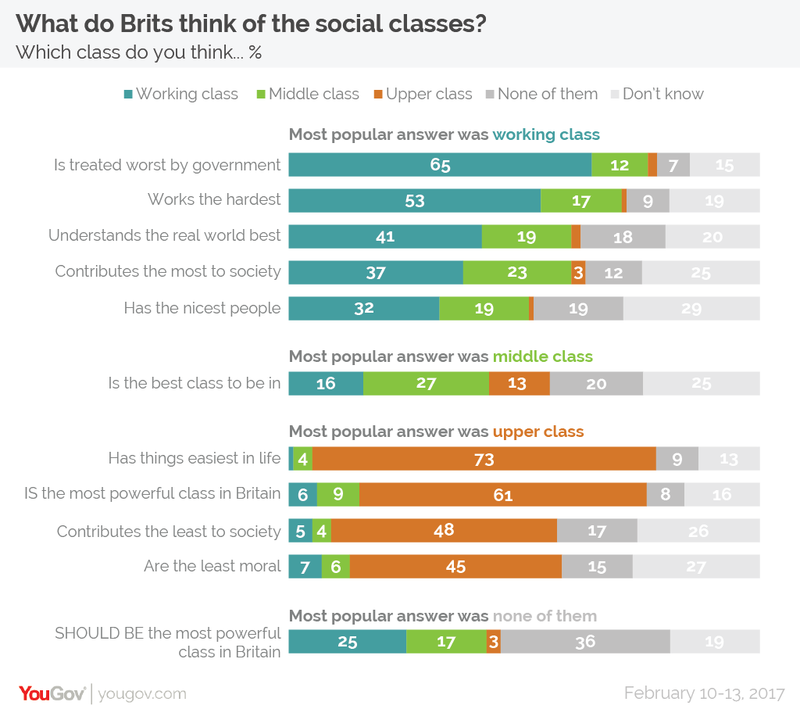 What do Brits think of the social classes? September 25, 2017, 11:00 p.m. Which class is hardest working? Which class has the nicest people? Which is the best class to be in? YouGov explores Britons’ perceptions of the social classes. It is often said that a person cannot understand British society without understanding the class system. Much work has been done to examine the nature of Britain’s traditional classes: working, middle and upper. But how do the classes feel about one another? Now two new YouGov surveys show what Britons make of their own and other social classes. The first reveals that Brits have the best view of the working class and the worst view of the upper class. More than four in ten (41%) have a favourable impression of the working class, falling to 29% for the middle class and 14% for the upper class. Brits are more likely to hold favourable views of their own class, and the fact that more people self-identify as working class (50%) than middle class (40%) goes some way to explaining why the working class is seen more favourably, but it is not by any means the whole story. The results clearly show a fondness for the working class among middle class people that is not reciprocated. 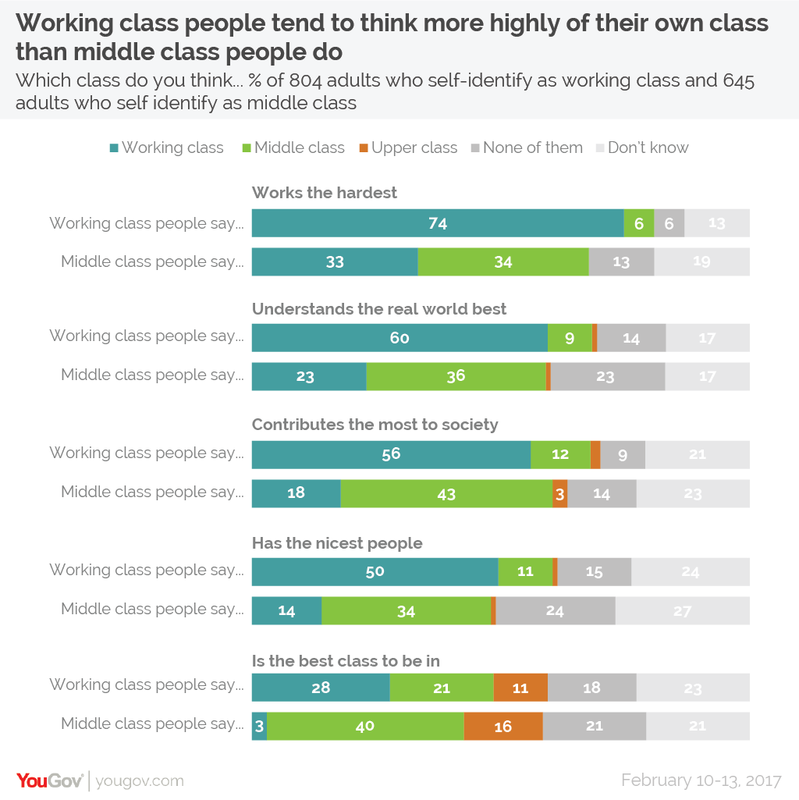 While both working and middle class people hold their own class in roughly equal esteem (48% favourable among working class, 44% among middle class), more than a third of middle class people (37%) hold a favourable view of the working class, compared to only 20% the other way around. The second survey explores which characteristics most applied to the social classes. Again, the working class comes out best, being seen to be most likely to possess the more positive attributes, and the upper class most likely to hold the less positive ones. The working class is seen as the hardest working (53%), the most in touch with the real world (41%), the biggest contributor to society (37%) and the class which has the nicest people (32%). They are also the class seen as the most mistreated by government (65%). The upper class, meanwhile, are seen as contributing the least to society (48%) and as being the least moral (45%), while also having things easiest in life (73%) and being the most powerful of the classes (61%). The middle class only comes out on top in one category – the best class to be a member of. This is also one of the categories on which Brits are most split. While only 27% of people think the middle class is the best group to be in, it is still higher than the 16% who say working class, 13% who say upper class, and 20% who say “none of them”. Once again, when it comes to attributes of the various classes, working class people are far more likely to be united in their positive view of their own group. On the other hand, middle class people are much more split. For instance, 60% of working class people say the working class understand the real world best while only 9% think the same of middle class people. However, among middle class people, only 36% think their own class understands the world best, while 23% believe the working class do. It is a similar story when it comes to negative descriptions of the classes. Working class people are more likely than middle class people to be united behind their disdain for the upper class (although the gap is narrower here). There is an exception, though, when it comes to which class is the best to be in. While middle class people are far more likely to think their class is the best one to be in (40%), working class people are split - 28% state that being working class is best while 21% believe it is better to be middle class.